Carolan Lennon, Managing Director of eircom Wholesale and Tim O Leary, Deputy President, IFA. Eircom has launched a nationwide competition to identify the next “Fibre to the Home” rural trial community. 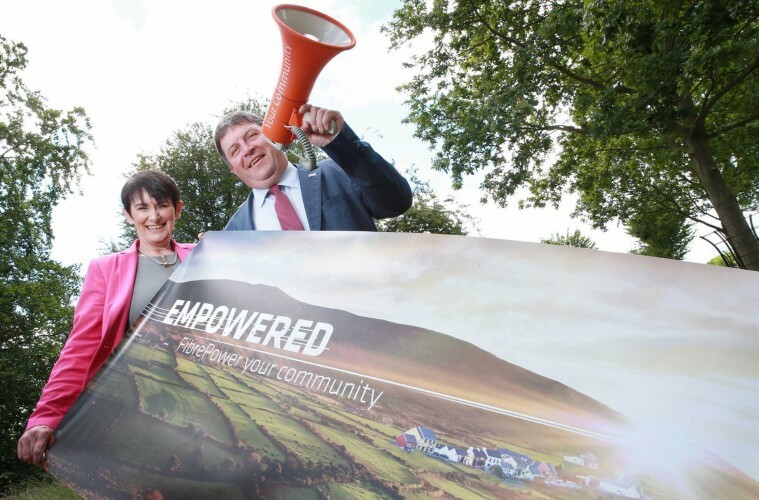 The competition will find the second town in Ireland for Eircom to deploy its “Fibre to the Home” broadband after it successfully ran an initial trial in Belcarra, County Mayo. Businesses and residents of the rural community have had access to broadband speeds of up to 1Gb/s as part of the roll out. As part of the competition, communities are being asked to present a compelling case as to why their locality should win and become the next Eircom Wholesale “Fibre to the Home” trial location. The competition is open to communities which have no access to high speed broadband and are awaiting the deployment of the National Broadband plan. “This “FibrePower Your Community” competition is part of our preparation to gain insights before we rollout new technology in scale. We want to ensure that deploying a high speed broadband network delivers real benefits to communities. In Belcarra, we saw first-hand how a community can benefit from this type of infrastructure. We believe this competition will highlight the huge demand for high speed broadband and demonstrate that an investment of this size can and will transform lives and businesses in rural communities” she concluded. To find out more about the roll out and for details on how to enter the competition, visit this link.